If you’ve been following along with my blog, you’ll know that I’m becoming a Sun Bum freak. It all started with the Sun Bum PRO SPF 50. I wanted something a little less expensive for use on the rest of my body and picked up the Sun Bum SPF 50 Moisturizing Sunscreen Lotion. Designed for extensive fun in the sun, this sunscreen lotion has accompanied me everywhere bare skin was showing for the last month. This is easy to apply before hitting the trails and is a nice, moisturizing lotion to help prevent scaly legs. It’s water resistant for up to 80 minutes before reapplication is needed. As a skin-conscious person, I really love how it’s paraben-free, PABA-free, and oil-free, with Vitamin E. This is also photo-stable, so it’s guaranteed to protect you against the sun without degrading instantly. This is coconut scented, so if you’re sensitive to sweet smells, this might not be good for you. Biggest con for me is how it doesn’t play nicely with other sunscreens, including other items from the Sun Bum line. My standard routine involves applying this liberally in the morning prior to starting on the trail. Reapplication is with the SPF 30 Continuous Spray since it’s easier to apply. Rubbing in the additional sunscreen makes this one clump up and come off the skin in little, ugly grey balls. However, that’s not really a deal breaker for me ’cause by that time, I’m super dirty and giving zero cares at that time. Buy through Sun Bum for $15.99. 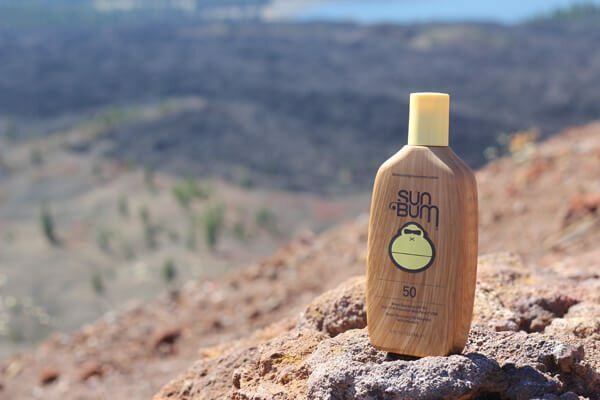 If you’re looking for more Sun Bum reviews, check out the PRO SPF 50 here and the SPF 30 Continuous Spray here.